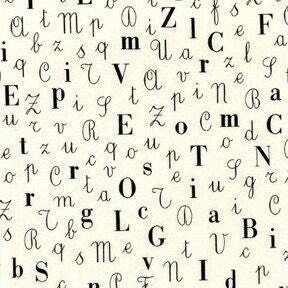 Do you have an alphabet related post on your blog? Tomorrow (Friday) we'll be hosting an Alphabet Blog Hop so everyone can share their ideas for teaching and having fun with the alphabet. Be sure to come link up! This will be the final installment of our Alphabet Craze Event, though you still have plenty of time to enter all of the great Alphabet Craze giveaways (listed at the top of our blog). Introduction: Amanda is the creative mastermind behind the Etsy shop Our Humble ABowed. Amanda has made art and print for her home for quite a while and is now pleased to be able to share her talent with others. Amanda also loves creating custom pieces of art. Selection: Our Humble ABowed carries 8x10 inch prints as well as custom cut out art, modern portraits and fabric items for your home. Here are several of our favorite things from Amanda's shop. 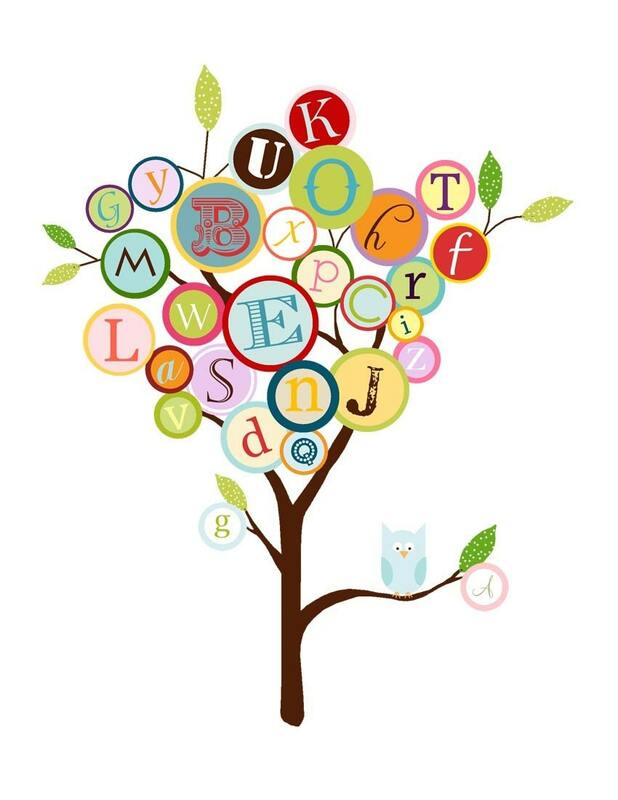 Review: We received a beautiful Alphabet Tree Print from Our Humble ABowed. This 8x10 inch print is perfect for a child's room or as a baby shower gift. It is customizable with the child(ren)'s initials and your choice of a bird in a nest or the owl as shown. Amanda can also customize the colors of the owl. Matching stationary is also available at The Humble ABowed's sister shop Customized Stationary (currently on maternity leave). Our print arrived quickly and carefully packaged. The colors are bright and vibrant and the details are very clear. Connect: Visit Amanda's Blog, Our Humble ABowed. Buy It: You can purchase your own Alphabet Tree 8x10" Print from Our Humble ABowed for $15. Win It: A Humble ABowed would like to offer our readers a chance to win your very own 8x10" Alphabet Tree print. The winner will be able to customize their print. Open to those within the continental US only. 1. Visit the shop, then come back and tell us one item that Our Humble ABowed carries that you'd love to have. The giveaway will end Thursday, April 14th at 11:59pm EST. We will pick the winner through random.org. Introduction: Nauvoo Quilt Co. is another great Etsy shop completely filled with beautiful fabrics. Julie owns this lovely shop and runs it from her Midwestern home where she lives with her husband and five children. Julie has sewn since she was very little and has a degree in clothing and textiles. Selection: Nauvoo Quilt Co. carries a huge assortment of fabrics. Julie also seeks out and carries antique quilts/pieces, feedsack and vintage fabrics. There are also many 1800s reproduction fabrics as well as 1930s-1950s reproduction fabrics. Nauvoo Quilt Co. also carries Asian fabrics, novelty fabrics for babies and children, flannel, solids, notions and basics, books, patterns and kits, as well as knits, corduroy and denim. Here are a few of my favorite things listed in the shop right now. Review: Julie sent us a half yard of Piccolo Alfabeto by Michael Miller. This high quality quilt shop cotton fabric is filled with beautiful black letters on a creamy background. The largest capital letters are only about 1/2 an inch tall. Our fabric arrived quickly and carefully packaged. The variation of fonts makes this fabric very visually appealing. This fabric is also awaiting its fate as part of a mini alphabet I Spy quilt. Connect: Visit Julie's blog or check out her Flickr page. Buy It: You can purchase your own half yard of Michael Miller's Piccolo Alfabeto at Nauvoo Quilt Co. for only $4.45. If you need more yardage, Julie is happy to create a custom listing for you. Win It: Nauvoo Quilt Co. would like to offer our readers a chance to win a 1/2 yard of fabric of your choice. The winner will be able to choose any half yard of fabric available at the close of the giveaway. Open worldwide. 1. Visit their shop, then come back and tell us one item that Nauvoo Quilt Co. carries that you'd love to have. Photo Credit: Nauvoo Quilt Co.
Introduction: Fun By The Yard is a wonderful Etsy shop that carries fabric and trimmings. The shop's owner, Meg is a crafter and loves to help customers find the exact fabric they are looking for. Selection: Fun By The Yard carries a variety of fabrics from top designers. Meg also carries ribbons, trim and yarn. Here are a few of my favorite items in her shop right now. Review: Meg sent us a yard of Michael Miller, Block Letters in Multi. Our fabric arrived quickly and carefully packaged. All of the cut edges were very straight and neat. This fabric from Michael Miller is bright and playful. Emahry and Jonathan both like finding letters and numbers on this fabric and love that the design looks like their own alphabet blocks. I love the quality of this fabric and can't wait to start sewing with it. This piece will be joining some others in a mini alphabet I Spy quilt soon. Buy It: You can purchase your own yard of Block Letters in Multi from Fun by the Yard for $7.50. If you need more yardage, Meg would be happy to help you find exactly what you are looking for. Win It: Fun By The Yard would like to offer our readers a chance to win a yard of your choice from their in stock fabrics. Open to those within the US and Canada only. 1. Visit their shop, then come back and tell us one item that Fun By The Yard carries that you'd love to have. Best Bottom Diaper System from Nicki's Diapers ~ Rebecca O. Thanks to everyone who stopped by and took the time to enter! 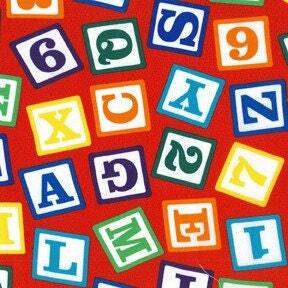 Introduction: Alpha Tot was started by two cousins, both busy moms who set out to make alphabet posters that parents could love as much as their children. 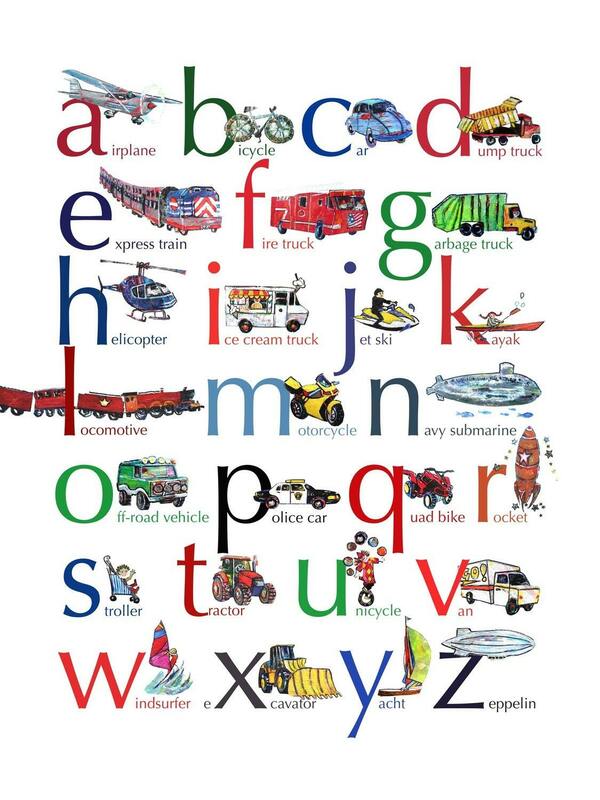 Selection: Right now Alpha Tots has a wonderful Vehicles, Things that Go Alphabet Poster. They offer this poster as a 18x24 unframed print, a 18x24 framed print and also as a 15x20 canvas print. 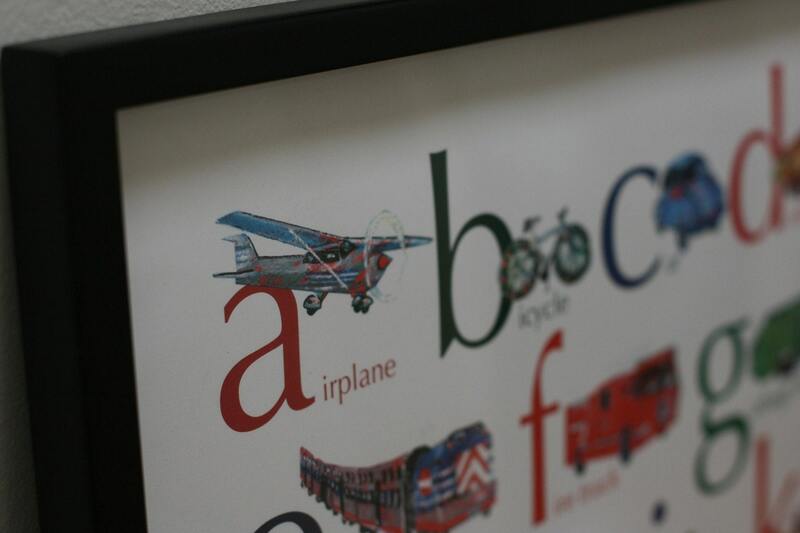 Review: We received the unframed Vehicle, Things that Go Alphabet Poster. The poster arrived quickly and was carefully packaged. 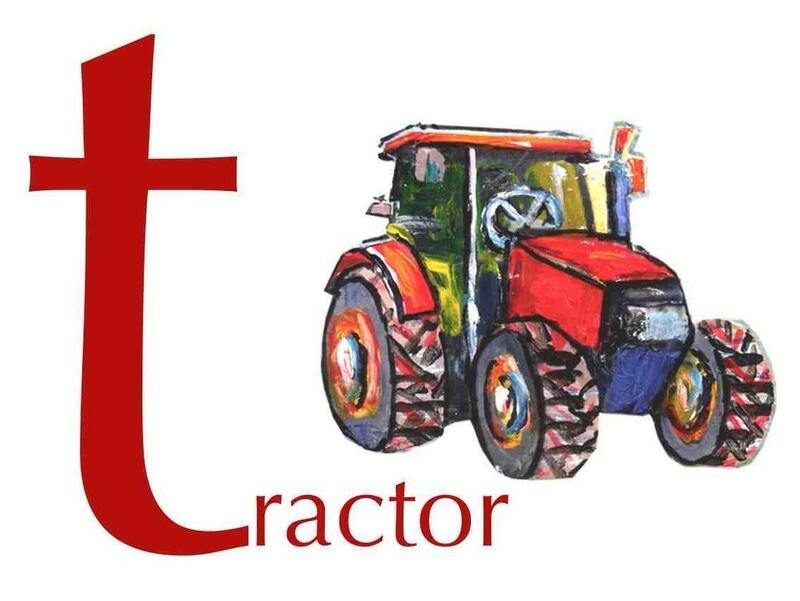 The colors are bold and the drawings that accompany each letter are detailed and fun. We have framed this poster and it now hangs with a couple other alphabet posters above the couch in our living room. Our whole family really likes this poster and we've received many complements on it. Buy It: You can purchase your own unframed Vehicles, Things that Go Alphabet Poster for only $14.99. Win It: Alpha Tot would like to offer our readers a chance to win your very own Vehicles, Things that Go Alphabet Poster. Open worldwide, but only available in English. 1. 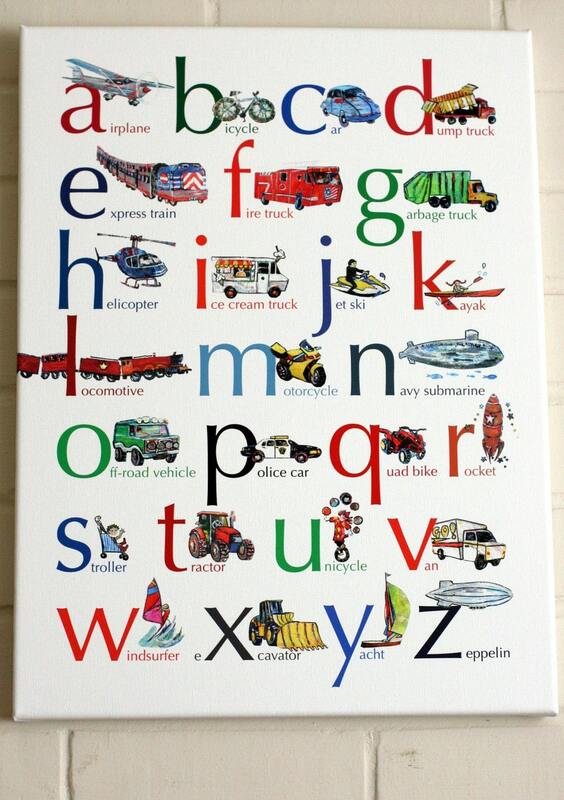 Visit their shop, then come back and tell us why you would like this alphabet poster from Alpha Tots. The giveaway will end Wednesday, April 13th at 11:59pm EST. We will pick the winner through random.org. Introduction: Nice Button and Nice Projects are Samantha's creative outlets. She has enjoyed crafts for a long time and is now fulfilling her creative dream by selling fun and interesting buttons and other handmade items in shops around Austin, Texas where she lives with her husband. Thanks to Etsy, Samantha's products are now available worldwide. 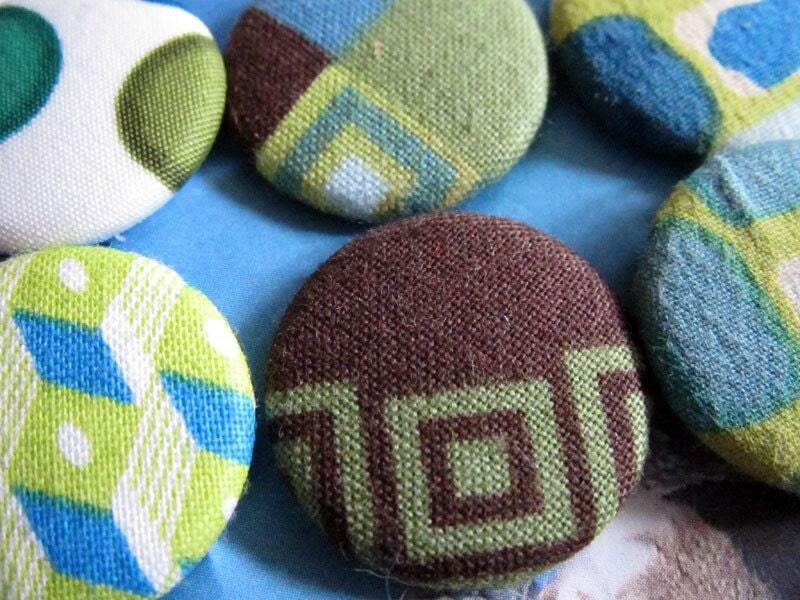 Selection: Nice Projects carries a variety of fabric covered buttons as well as fun and functional magnet sets. Here are a few of our favorite things from Samantha's shop. Great for creating one of a kind, miniature, works of art. Wouldn't these be great for children to paint? 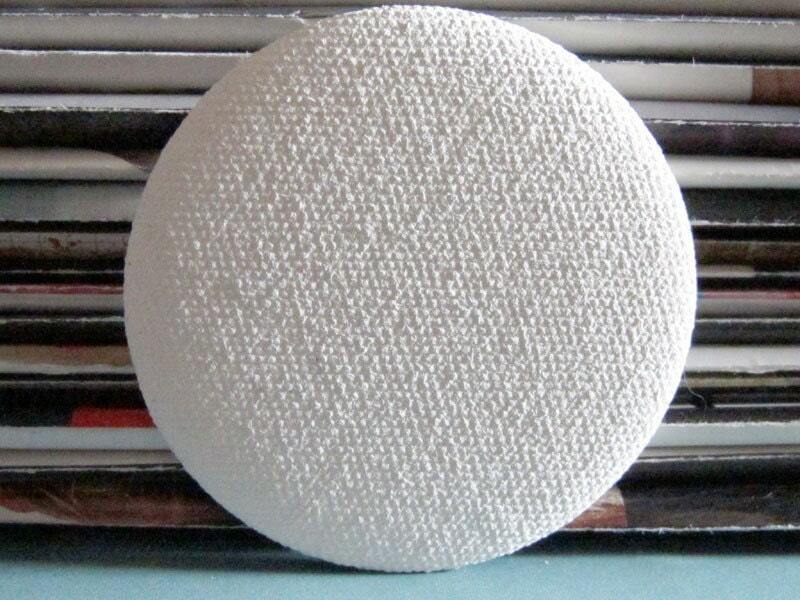 This is also available as a pinback button to make wearable art. 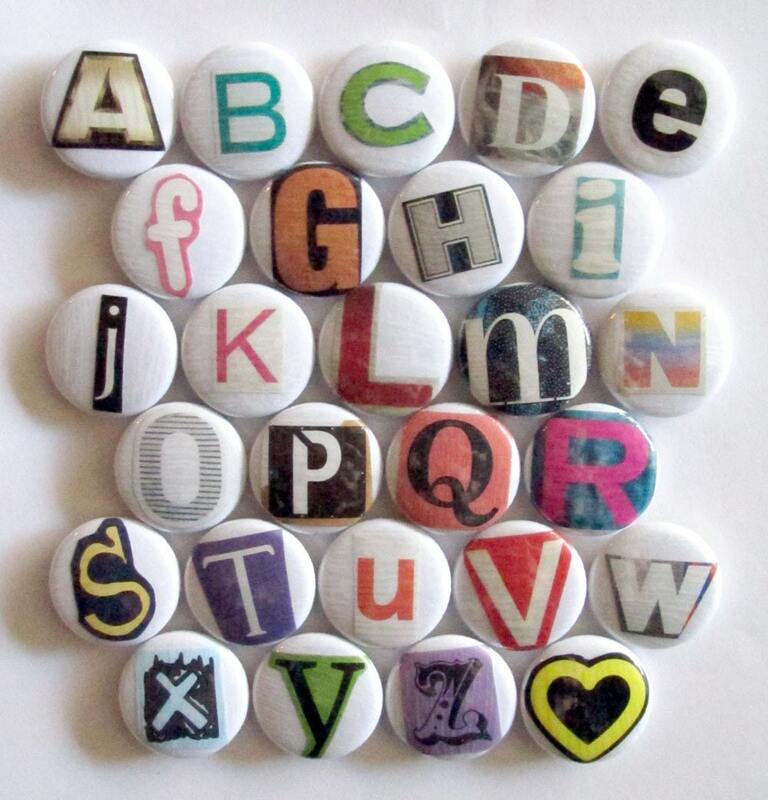 Review: Samantha sent us this adorable Alphabet Magnet Set. This is a 27 piece alphabet set with lowercase letters a to z plus a cute smiley face (or heart). The font is called "Kids' Hand" and was created by Samantha. The designs are printed on recycled paper and the buttons are backed with sturdy magnets. These magnets are small (about 1 inch in diameter) and would not be good for young children who still like to put things in their mouths, but our two oldest (3 1/2 and 2 1/2) love this magnet set. Emahry especially love to play with these magnets. She likes the bright colors and "writing" words on the fridge or her cookie sheet. Samantha can also customize this magnet set to include enough letters to spell your child's name or a specific phrase. You can also add additional letters for $1 each or 10 letters for $9. Simply convo Samantha with your request. Connect: Keep up with Nice Button on Etsy, Facebook, or the Nice Button Blog. Also check out Samantha's t-shirts. 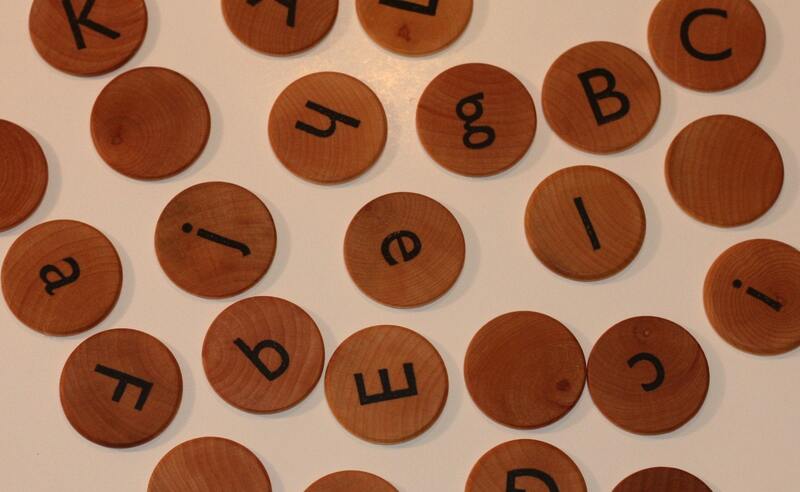 Buy It: You can purchase your own Alphabet Magnet Set for $20. 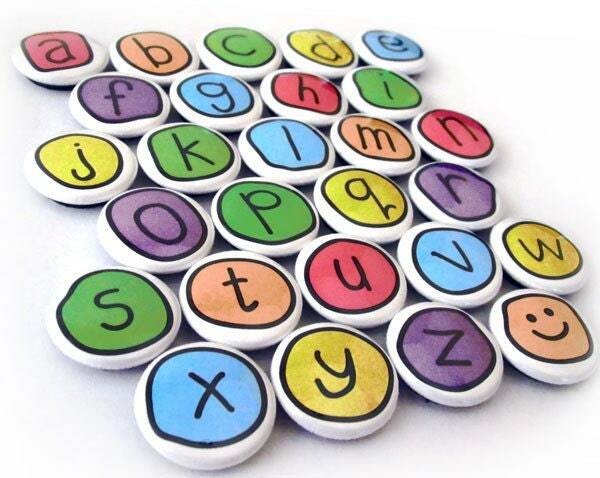 Win It: Nice Button would like to offer our readers a chance to win your very own Alphabet Magnet Set. Open to those within the continental US only. 1. Visit the shop, then come back and tell us one item that Nice Button carries that you'd love to have. Introduction: Ashley is currently an at-home mom with her beautiful and very active daughter. She taught first grade in the past and holds a degree in Elementary Education and Early Childhood Education. Ashley also has a Master's Degree in Reading and Literacy. She loves spending time with her family and friends and creating games and resources for teaching little ones. Ashley blogs at Me & Marie where you can find tons of great ideas for teaching your little ones. Ashley also has an online shop where you can purchase fun and educational activities for helping your children learn. Selection: The Me & Marie Learning Shop is filled with adorable games, pretend play props, learning packs, story units and more. You can also purchase packs for preschool circle time. Ashley also offers seasonal learning packs, a dollar section and several freebies as well. All of the items in the Me & Marie Learning Shop are available for immediate download as a PDF file. Here is a small sampling of the wonderful products you can purchase and download from the Me & Marie Learning Shop. Review: We received an Alphabet Pups Baggie Game as well as a Letter Cc and Letter Ii Learning Pack from Me & Marie Learning. The Alphabet Pups Baggie Game is fun, educational and fits inside a sandwich bag. This pack includes the following three games. We easily downloaded this game pack and printed the pages on white cardstock . For extra durability you can laminate the pages (something on my to do list). I love these games from Me & Marie Learning and the kids have really enjoyed them as well. Ashley's Letter Learning Packs are packed full of wonderful resources and activities for young children. Here's a list from Me & Marie Learning of what is included in the Letter Learning Packs. Letters, Letters, OH MY! Check out all the GREAT materials in this pack at a great price! Label: This label is for you to use when storing the letter materials. Consider storing each letter in a different bag, file folder or notebook. Use this label to quickly identify which letter is being stored. Large Letters: An uppercase and lowercase letter is included in the pack. Decorate these letters with the ideas given. Letter Picture Cards: Four picture cards displaying pictures of items using the target letter of the alphabet. Letter Poem: A great poem to read together! It is short, easy and contains pictures! Consider having your child highlight all the target letters with a highlighter. Display on the fridge or bathroom mirror and recite often! Letter Snack and Sensory Ideas: This page of the pack contains a snack recipe focused on the target letter for you and your little one to do together. A Sensory Table idea sheet is also included giving ideas of materials you can put in your sensory tub that start with the target letter. Letter Book: A fun, repetitive, rhyming book to create together. Dot Paint Letters: These letters were created to be used with Dot Paints. Letter Flipbook: A repetitive and easy to assemble flipbook focusing on the target letter. Your child will be able to help read this book with the accompanying pictures. Letter Hunt: Search for letters in many different places! Look on food packaging, mail, magazines and newspapers for the target letter. Then, glue the letters you found on this Letter Hunt sheet. Letter Puzzles: Mix up and piece the letters back together! Letter Lacing: Get out the string or yarn for lacing fun! To prepare, hole punch each gray dot on the uppercase and lowercase letters. Have your child lace around each letter going in and out of each hole. Letter Size Up: Help your little one order the capital letters by size. Letter Sort: Sort the target letter by lowercase or uppercase. Use the sorting mat included. Letter Writing: Pre-writing and letter writing practice page. Start at the top of the page and help your child practice the strokes needed to form the target letter. Once he or she has mastered the strokes, move on to tracing the letters. After your child shows confidence in tracing the letters, have them create their own letters using the last line of the page. Letter Match Up: Practice matching uppercase to lowercase with this fun game. Puppet: Make a puppet to focus on the target letter. Follow the directions on the puppet page to create. Here's a look inside the Letter Cc and Letter Ii Learning Packs that we received. We printed most of these pages on white cardstock (the ones that would be reused). We've also laminated several items to help them last even longer. Emahry has really enjoyed these sets, she especially likes all the colorful pieces. Jonathan's favorite activities right now are the do-a-dot pages. Buy It: You can purchase your own Baggie Game Set from Me & Marie Learning for only $3.00. The Learning Packs are also only $3.00 a piece. Win It: Ashley would like to offer our readers a chance to win a $10 Gift Certificate to the Me & Marie Learning Shop. 1. Visit the shop, then come back and tell us one item that Me & Marie Learning carries that you'd love to have. Introduction: Magens Bay Designs is Brooke's Etsy shop. It's where Brooke uses her creative talents to share beautiful blocks for children. Selection: Magens Bay is filled with gorgeous patterned and personalized blocks for any child in your life. Brooke's beautiful blocks come in a handy canvas bag for storage. Here are just a few of our favorite items in Brooke's shop. Review: Brooke sent us an Alphabet Memory Match Game with capital and lower case letters. Both Emahry (3 1/2) and Jonathan (2 1/2) really enjoy these small wooden alphabet coins. They use them a lot for pretend play, especially when they are "going" to the grocery store or "baking" crackers or cookies. We've also used them many time to reinforce the letters of the alphabet and to practice matching capital and lowercase letters. We ordered our set of of Alphabet Matching pieces with two different colors of font, one for capital letters and one for lowercase letters. This makes it really easy for me (or even Emahry) to separate the letters for different activities. I love the quality of these game pieces and that they are sealed with an organic beeswax polish. I also love the cute drawstring canvas bag that they came with. Buy It: You can purchase your own Alphabet Memory Match Game for $17.50. This game would make a great addition to a learning at home atmosphere and would also be a wonderful gift. Win It: Magens Bay would like to offer our readers a chance to win your very own Alphabet Memory Match Game. The winner will be able to choose the color of the font from black, red, blue, green and purple. Open to those within the continental US only. 1. Visit the shop, then come back and tell us one item that Magens Bay carries that you'd love to have. The giveaway will end Tuesday, April 12th at 11:59pm EST. We will pick the winner through random.org. I’m was so excited to be asked to participate in Alphabet Craze! I hope you will find my alphabet learning activities, fun and hands on. I’m sharing a few of my Letter A Activities with you today, and you can click here to see my entire Letter of the Week A-Z Curriculum! Apple Large Floor Numbers: I made these large floor numbers so that we can play a hopscotch type game. I call out a number and she jumps to it! You could also have them put the cards in numerical order. The number cards go from 1-10. Capital A/Lowercase a matching game: This is a great way to match up lowercase and uppercase letters. Simply cut the apples from pg2 and place them on top of the same or opposite letter case on the tree. Apple Color Puzzles: Cut out each apple then cut it in half in various ways to create color matching puzzles. Name each color as you put them together. Apple Letter Matching: This is a fun letter matching activity, that practices both upper and lowercase letters recognition! If you're looking for more challenge, use the uppercase card with the lowercase letter disks or visa versa! (The download includes upper and lowercase letter disks and activity cards) Click here to see how to make the letter disks. Letter A Do-A-Dot Page: We use Do-a-Dot Art Markers with this! I hope you like my alphabet activities, click here to see the full set of Letter A Activities. I also make K4 Level activities for kids who are a little beyond preschool, but not quite ready for Kindergarten! 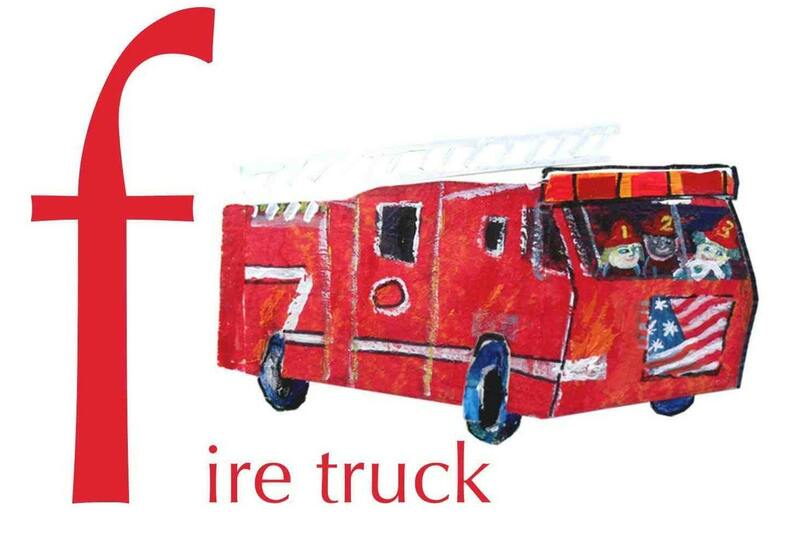 Click here to see my K4 Curriculum Activities! Click on the images below to see more activities! Erica is a daughter of Jesus, a wife, a mom, and a homeschooler. She likes to digiscrap and dabbles in graphic design in her *free* time. She authors Confessions of a Homeschooler and would love you to drop by for a visit anytime!